Some of my all-time favorite horror films over the years (and decades) have been set on barren highways, or rural roads. And Soon the Darkness (1970), set on a treacherous stretch of road in France, is one of the absolute best of this school. As you may recall, the film concerns two young women on bikes navigating a stretch of road in which a vicious murderer is working. Pamela Franklin stars in the film, and the film feels like a nightmare from which one cannot awake. Franklin's protagonist keeps going back and forth over the same paces, seeking help, while night looms ever closer. We are conscious that she plays a losing game, as she is racing against not merely a murderer, but sunset itself. This (great) film features an air of inevitability, and there is no escape valve by which the audience can escape the dread and tension. Even years after my last re-watch, I can remember the specifics of the final, overhead shot. And Soon the Darkness is literally that good. It’s a highly underrated film. Richard Franklin’s Road Games (1981) is another beloved film of this type. Here, Jamie Lee Curtis plays a hitchhiker in the Australian Outback. She teams with a friendly trucker (Stacy Keach) and his pet dingo to stop a serial killer who likes to strangle young women. This artfully-constructed thriller is like a mobile (and playful) version of Hitchcock’s Rear Window (1954). 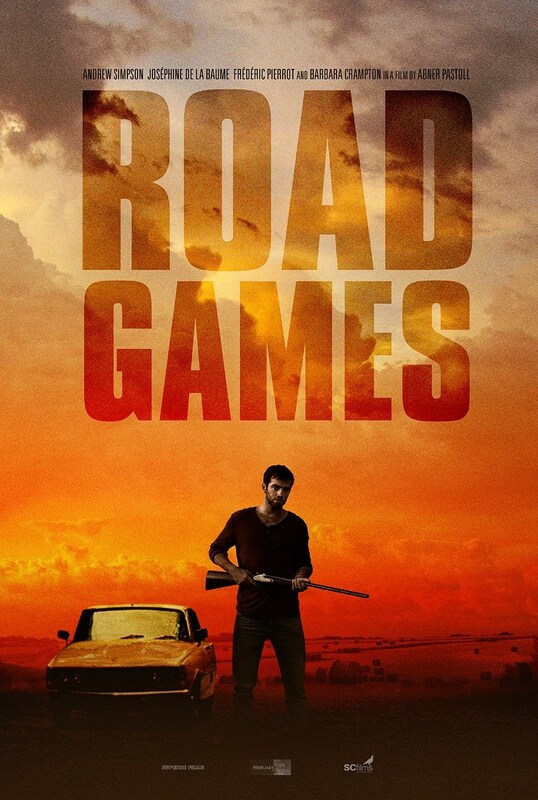 Although featuring far more in terms of its wit or gallows humor, Road Games shares with And Soon the Darkness a sense of utter inescapability. This choking atmosphere of inescapability is no mean feat for a movie set on an open road. A road, by definition, is a path to distant destinations. Escape should be a foregone conclusion: just set your eyes on the horizon and run in one direction until you are safe. But both films find plausible -- as well as maddening -- reasons to keep the protagonists on that increasingly closed-in road, in constant danger. A new French-made horror film -- also titled Road Games -- is not a remake or a reboot of the eighties film, but instead an intriguing variation on the themes of both And Soon the Darkness and Franklin’s film. From And Soon the Darkness we get our primary setting: another stretch of isolated, rural French road. And from the Road Games of the 1980s, we get hitchhiker protagonists. Similarly, all three “road horror” films, of course, revolve around a serial killer whose identity remains unknown to the audience until the climax. Much of the fun in this version of Road Games undoubtedly arises from the thriller’s “whodunit” game. The film offers at least five different possibilities for the serial killer’s identity, and keeps the audience guessing to the bitter end. Featuring no big special effects or elaborate set-pieces, only an atmosphere of mounting terror, Road Games is a good old fashioned “road” horror film and one that is a perfect -- even delicious -- companion piece for And Soon the Darkness and the earlier Road Games. Like each of those genre classic, the 2016 Road Games manages to set up the nastiest of traps for the protagonist, again playing up against the apparent “freedom” promised by an open road. This 2016 film adds to the road horror film equation or formula in some fascinating ways, but mostly in its final reckoning that victory (and, indeed, escape) are illusory. A lonely English hitchhiker, Jack (Andrew Simpson), walks alone on a rural road in France. He is surprised when an approaching car nearly runs him off the road, and the driver and his passenger argue violently. 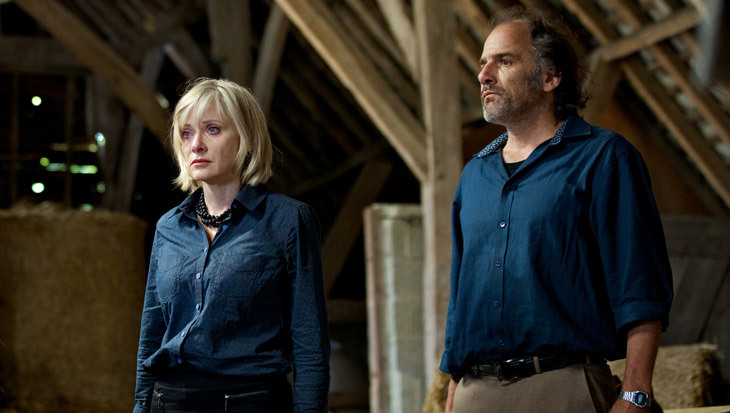 Jack rescues Veronique (Josephine de La Baume), the passenger, and the car driver leaves them stranded. 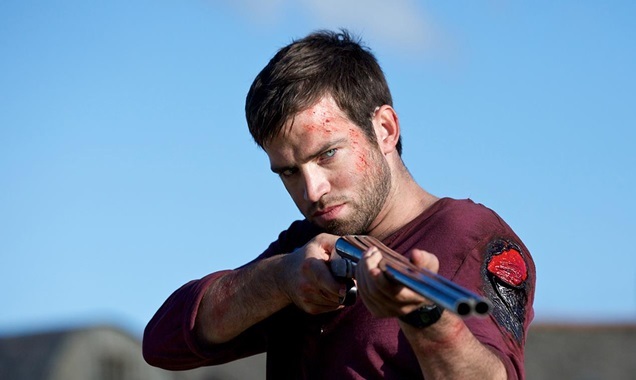 Jack and Veronique strike up a friendship as they hitchhike, and Veronique informs him that they are on a dangerous stretch of land, one where a serial killer preys on the vulnerable. They decide that there is “safety in numbers” and stick together. The next day, Jack and Veronique get a lift from a middle-aged man named Grizard (Frederic Pierrot), who offers them a meal and a shower at his home nearby. They reluctantly agree to go to his home, after he reports that his wife, Mary (Barbara Crampton) is lonely, and likes visitors. Jack and Veronique find that Grizard and Mary are an odd couple indeed, and that some unknown tension seems to roil the household. Veronique wishes to leave the household at once, but Jack convinces her to stay the night. The next morning, after Jack and Veronique have made love, Grizard reports that Veronique has left the home, and resumed her hitchhiking. She even left a note. There are five main characters featured in Road Games, and the “game” angle of the title comes into the picture in terms of audience attempts to discern the identity of the serial killer. Jack -- our protagonist -- is extremely nosy, and isn’t hitchhiking with any bags or luggage…which seems odd. Veronique is “too good to be true,” perhaps -- every man's sexual fantasy -- and she reveals, around a camp fire, a grisly story about how her beloved brother was killed during a game of hide-and-seek, mangled by a tractor in a field. Grizard is the oddest of birds, friendly and welcoming one moment, distant and aloof the next. While driving his car, he eyes Veronique creepily. 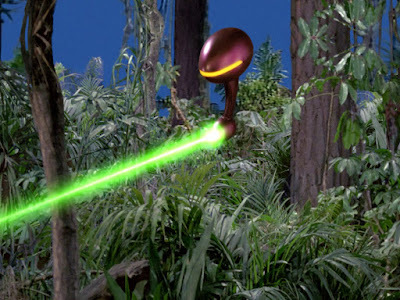 Throughout the film, he seems to operate on a secret agenda of his own design. As viewers, you never quite trust him. Mary seems to be slowly going insane, and burdened by some heavy invisible baggage like guilt or shame. She possesses deep secrets, no doubt, as well as a penchant for creating ghoulish art. Finally, there’s Delacroix, a man that Jack encounters on the road while looking for Veronique. It’s Delacroix's job to collect all the road kill in the area, and he goes about the task with perhaps too much enthusiasm. Much of the film’s cleverness -- in terms of performance, writing, and staging -- emerges from the fact that all the characters seem a little bit off. The performances are strong, particularly Barbara Crampton’s. She plays a consistent character from point A to point Z, but our understanding of Mary changes, virtually scene-to-scene. After the movie ends, it is clear who she is, and the demons she is grappling with. She starts out as the most inscrutable or cryptic of individuals, but ends, in some fashion, as the most sympathetic. Like the 1980s Road Games, this 2015 film features a strong gallows sense of humor. Almost instantly, we see Jack hitchhiking, right there. If one were to read the subtext of the film -- and Jack’s character, in particular -- as concerning someone who “plays with fire,” or is impulsive, that leitmotif commences immediately, with this visual joke. It continues in his interactions and behavior with virtually every character he encounters. Jack is not wrong to perceive this motto or manta as a kind of sexual come-on, which makes Veronique a single man’s “dream hitchhiker"...though with just one flaw, as the movie reveals. In terms of inescapability, and indeed plausibility, Road Games scores pretty high. There is always a legitimate reason for Jack to stay in danger. I enunciated that reason above, perhaps: Veronique is a figure of spontaneity, liberation, and youthful vitality/sexuality. Until satisfied that Veronique really left him alone in Grizard’s house, Jack can’t bring himself to leave. He has to keep returning. He must find her. Road Games features several delightful and wicked moments worth lauding. Other than the mistaken identity game, which involves all the characters to some degree, the film makes a point of exploiting the language barrier. The film’s events would end in an entirely different fashion if only Jack could speak and understand French. He can’t, but thanks to subtitles, we can, and so the last several scenes -- involving speeding cars, a shotgun, an impaling, and a farm --are incomprehensible to him. Indeed, these moments set up perfectly a closing “stinger” that suggests more horror may yet arise from the likes of those who dwell on this pastoral stretch of road. Freedom isn't about getting away from a place, perhaps, but rather from the person who rides shot-gun in your car. I would like to write more about the film’s numerous twists and turns, but as one character notes in Road Games, “some things need to be hidden.” I wouldn’t want to spoil for horror fans the thrill of finding a modern day version of And Soon the Darkness or Franklin’s Road Games. This Road Games is very good indeed (but not too good to be true). Umm... is Jack and Veronique supposed to be brother and sister?